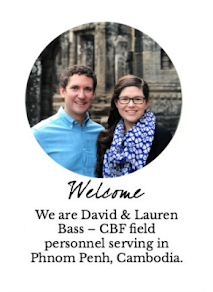 David and Lauren Bass: ARE YOU READY? Two weeks ago, Lauren and I packed up our apartment and drove back to Texas, leaving behind the life we had made there for the last several years. We are in Texas for a few weeks, but we have one-way tickets to Cambodia on October 22. We have no jobs and no home in the US, and we have a definite date to move to Phnom Penh. This is happening. This is happening very soon. One of the most common questions that I get these days is, “Are you ready?” That depends on how you define ready. If ready means that I am packed and could get on a plane any day, then no, I am about as far from ready as it gets. I used to think I lived a relatively simplified life when it came to owning possessions. Compared to Lauren, however, I am a hoarder, so now we have the tough project of going through our (fine…my) stuff. Not only are we not packed, we haven’t unpacked from Colorado so that we can then begin the process of packing for Cambodia. Our stuff is currently spread out among my in-laws’ living room and my parents’ garage. Hard to say you’re packed and ready when you’re not even pre-packed. If ready means that I have gotten closure on every relationship, then no. I have really been struggling with how to say goodbye. I’m too much of a perfectionist to ever actually think I’ve said goodbye perfectly. I know in my head that relationships are messy and don’t ever tie up neatly like a homework assignment, but it’s still hard for me to live as if that is true. I will miss my friends, family, small group, church, co-workers, and even my acquaintances terribly, and no matter how good Cambodia feels, I will never get to the point where I am “ready” to say goodbye to these people. If ready means that I am fully confident in my ability to handle every single thing that awaits me in Cambodia, the answer will once again be no. Sometimes, I am really quite nervous. The language, fitting in with the culture, being successful at the job I am called to…I have my doubts about all of these things. I have doubts about myself. It sounds like I’m not all that ready. You could certainly make that case. But, if ready means that no matter what, I’ll be getting on that plane next Thursday, then yes, I am ready. I will be packed. I will have said my goodbyes as well as I’m going to and will be learning to show myself the grace to be imperfect in that area. If ready means that I am ready to stop being in the transition phase of getting ready for ministry in Cambodia and ready to start getting my hands dirty with the next step of my calling, then I am more ready than you know. Yes, I’ll be imperfect, but God goes with me and has shown me grace before, so I will have to trust that he’ll take care of this one, too. This is big, scary and completely out of my control. And there’s something refreshing about following God into those kinds of situations. And for that, I am ready.